Back in the days before power steering, large diameter steering wheels were necessary to give the driver enough leverage to manoeuvre at slow speeds. With the advent of EZ Electric Power Steering a kit or classic car can be steered at walking pace without effort – and that means that the diameter of the steering wheel can therefore be reduced to provide a better driving position, easier entry and exit, more legroom and more direct steering. However, rather than fit an extremely small steering wheel that could look out of place in a classic car or replica and also perhaps block the view of the instruments, EZ Power Steering chose the traditional way – inspired by the Le Mans drivers in the 50’s – resulting in a period-correct solution for extremely tall drivers. 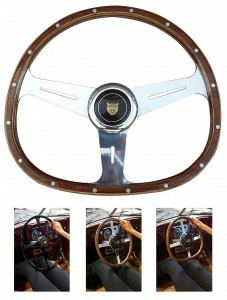 The EZ Power Steering Le Mans steering wheels fit a large variety of cars and several options are available such as a choice of three or four spokes, Bakelite black-, laminate wood – or solid wood rim, polished spokes or black finish, solid spokes, drilled or slotted and finally with rivets or without. 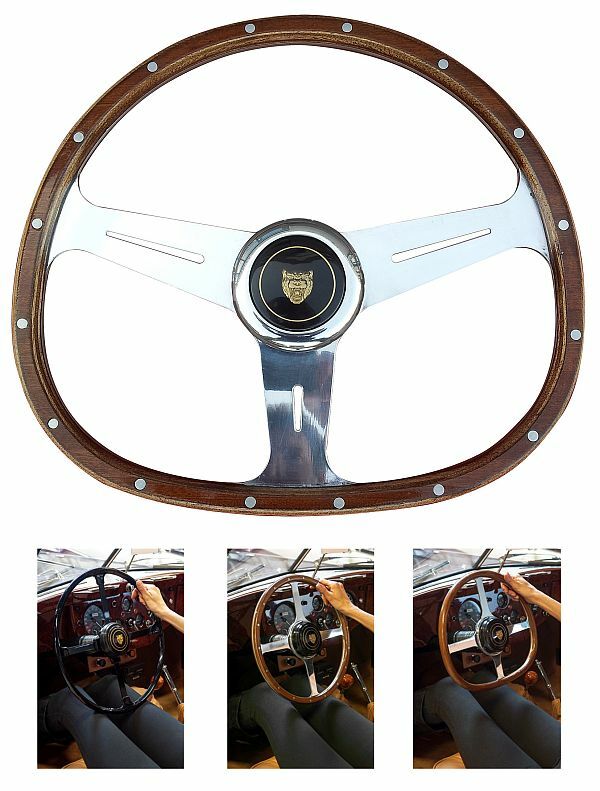 Depending on the chosen options, the prices of these special steering wheels vary from £310 to £620 inc VAT, excluding hub and horn push. The four-spoke wheels fit Moto-Lita bosses while the three spokes fit Nardi bosses (also available from EZ Electric Power Steering). More information from www.ezpowersteering.nl ENDS. Print article This entry was posted by admin on February 28, 2013 at 6:20 pm, and is filed under News. Follow any responses to this post through RSS 2.0. Both comments and pings are currently closed.